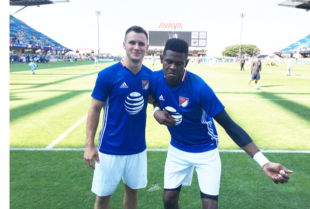 This week is MLS All-Star Week, where MLS’s best and brightest and also Brandon Vincent have gathered in scorching San Jose in preparation for Thursday’s match against Arsenal. For the first time since 2012, Philadelphia Union have a player on the roster who is not there as an injury replacement. They have two of them, in fact — goalkeeper Andre Blake and right back Keegan Rosenberry. The accomplishment is even more notable because both are in their first full year as a starter — Rosenberry is even in his first year in the league. The fan vote, which so often looks like a pure popularity contest, got it right in choosing both players, who are clearly the best performers at their respective positions through the first half of the MLS season. PSP’s West Coast Bureau (read: me) caught up with the pair after Tuesday’s training session, which had approximately the same ambiance and intensity as an awkward mixer at an office supply convention — if all the convention-goers were kicking a ball around a pristine grass field while a thousand people watched. Blake and Rosenberry were relaxed and enjoying themselves in the Silicon Valley heat, as you can see from the photo. A lightly edited version of the interview is below. What’s the All Star experience been like for you so far? It’s been great so far. You know, the top guys in the league — or maybe I should say the guys who’ve been performing the best in the first part of the season — and it’s great. It’s a great bunch of guys and everybody likes each other (laughs), so hopefully we can go out and get a good result on Thursday. On the behind-the-scenes stuff — how much time do you all spend together? Last night we had a reception, a welcome dinner. So we did get some time to hang out, and talk a little bit, and to get to know each other. What are you looking to take away from this experience? It’s a great experience. And, for me, it’s an honor to be here. But, most importantly, I want to enjoy the week because, as some people would say, like, I’ve earned it, you know? So for me it would be a waste if I worked that hard in the first part of the season and then did not have a good game on Thursday. So for me the biggest thing is to enjoy the week, of course, enjoy the moment, but also to go out and put on a good show on Thursday. Has Dom [Kinnear] told you if you’re starting on Thursday? No, he hasn’t said anything to me. But I’ll be ready for whenever my number is called. If I get to start, great — I’ll be ready. If not, whenever I go in, I’ll still be ready. So I just have to be professional about it. Arsenal, one of the great clubs in the world — anyone from there that you’re either looking forward to meeting or getting to play against? Well, more likely I’m looking to play against them. They’re a very good team. And, if you want to be the best, you have to be able to play against the best and see how you match up. So for me that’s the biggest thing. It’s going to be great meeting great players, but more importantly playing against them and actually measuring yourself and see where you stand. And how do you think you’ll measure up? Well, I’m hoping for the best. I’m a human, and I’m definitely going out there to do my best. But let’s see what happens. Last year you were fighting through injury, and the year before you were on the bench. What does it mean for you to have come out, grabbed the starting job, and now you’re the fan-voted keeper in the All-Star Game? It’s great. One thing I’ve learned from that is that I’ve built a lot of character, and I also learned that things do happen for a reason, and sometimes you have to go down a path which probably you don’t like, but for some reason you’re there. And you’ve just gotta hang on and wait your turn. Keep working hard, and don’t get bitter — get better. Last real question. I’ve heard that Keegan is a great hairstylist. Is he going to give you a fresh cut before tomorrow? Yeah, for sure. He’s my personal barber (laughs), so I’m definitely looking to get something fresh for the game on Thursday. Yeah, a little bit. Are you keeping cool? This is your vacation, a little bit. A little bit. But if my vacation is playing soccer with these guys out here, I think I’ve got it pretty good. Yeah, absolutely. This is your first time on an All-Star team obviously. Who have you got to meet here that you’re looking forward to meeting? Andre said the guys are all great, what do you think about that? Yeah, I would agree. I think just coming out here and having these guys be as nice as they are, and as welcoming as they are — that gives you confidence as a younger player. And, just to be able to sit down and talk to them, or see how they interact with the media and see how they handle themselves on the field, it’s an awesome experience. There isn’t an All-Star hazing ritual? I haven’t seen one yet (laughing). Hopefully there isn’t. So, from your perspective, this time last year you’re still at Georgetown, didn’t know where you’d be drafted, if you’d be drafted. What does it mean to you to be here right now today? I mean, it’s quite the honor. For this league, this is the ultimate. This is what you work your whole career for sometimes. And for me, it’s something I couldn’t have imagined being at Georgetown last year, a year ago. But again, I’m just blessed to have the opportunity I did to play. Players have come into this league with just as much talent and work ethic as I have, and they’ve got a captain or a ten-year starter in front of them, so they don’t get the opportunity. So I’m thankful for that. And also the team success we’ve had this year. Dre and I don’t get this kind of recognition and opportunity if our team doesn’t start the way we did. So thankful for the group of guys we have as well. Did the guys send you off in any way? Have they been in touch while you’ve been out here? Yeah, a couple guys reached out, you know, to say good luck and have fun and — the guys who’ve experienced this before to say, hey, just soak it all in and try to have a blast this whole week, and don’t get too wrapped up in being nervous and all that. Just have fun, you know what I mean? It’s good to hear from some of those older guys who’ve experienced it, it’s kind of comforting. You guys are going up against Arsenal on Thursday. Who are you looking forward to matching up with in the Arsenal squad? You know, I’ve gotten that one before, and I can’t say I’m focused on one guy. They’ve got so many good players across the board. We had a little meet-and-greet with some of their players, and I got to talk to Santi Cazorla and Kieran Gibbs, so that was really really cool. Just to see them off the field as well, you know, with the profiles they have and stuff — similar to some guys here. Just to kind of interact with them, really nice guys, kinda talked about their trip right now and how much traveling they’re doing. So it’ll be cool. I’m looking forward to it. Kinda makes your cross-country flight seem short? Yeah, it sure does — eleven hours back to England, that’s crazy. What are you looking to get out of this — are you looking to grow as a player, trying to understand that this is where you can be? What are you trying to get out of this? I think so. I think this is the goal from now on — I gotta try to get back here every year. And that’s not easy — like I said, players work their whole career to get here once. I’m blessed to be here my first year, but that’s kind of the motivating factor, trying to continue to get back. And I think just the relationships that I hope I can develop with some of these guys. Whether it’s brief and minimal, but, like I said, I’m so excited just to be here with these guys. Last question — I already asked Dre this. I’ve heard you’re a barber. How many of the guys are you planning to give a fresh cut to on Thursday? Did you bring your stuff with you? Yeah, I did bring my stuff. Dre, I actually already cut. He texted me before we even left and said “Hey, man, I’m looking a little shaggy.” So I actually cut him right when we got here on Monday. But other than that nobody has asked me yet. If they come to me, I’ll do it, but I’m not going to go out on a limb (laughs). Gotta give it time to get around the league? The first sentence is the best I have read in a while. HA! Well done! Kljestan with an olive branch across the Pink Cow – Union rivalry?